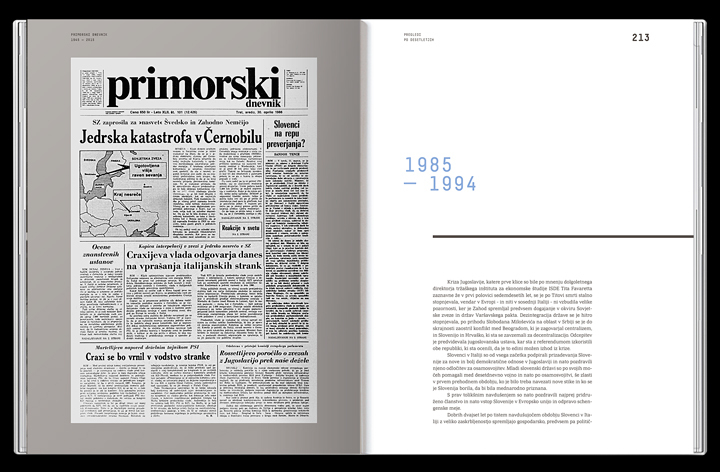 Primorski Dnevnik (translated as ‘The Littoral Daily’) is a Slovene language daily newspaper published in Trieste (Italy). 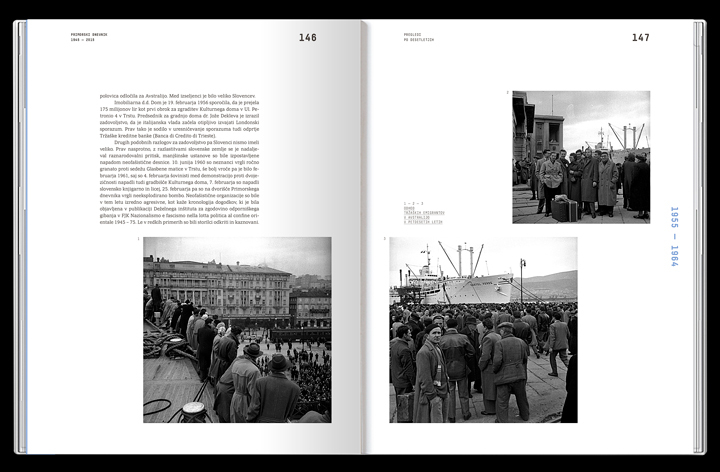 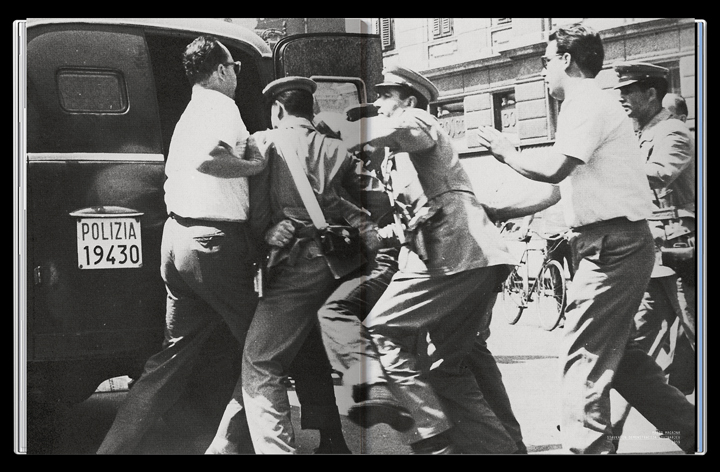 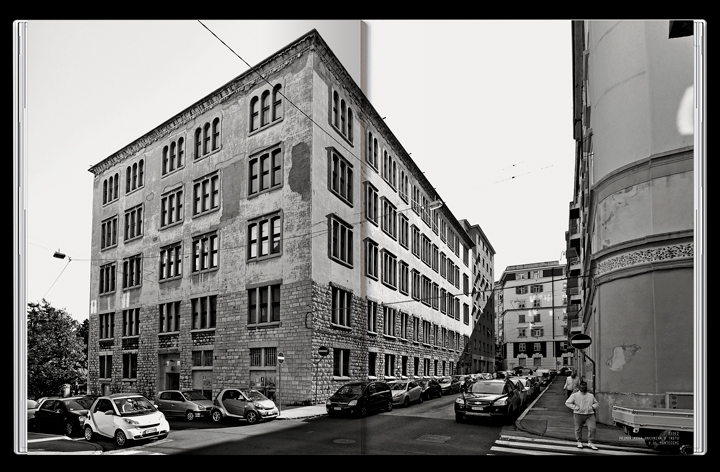 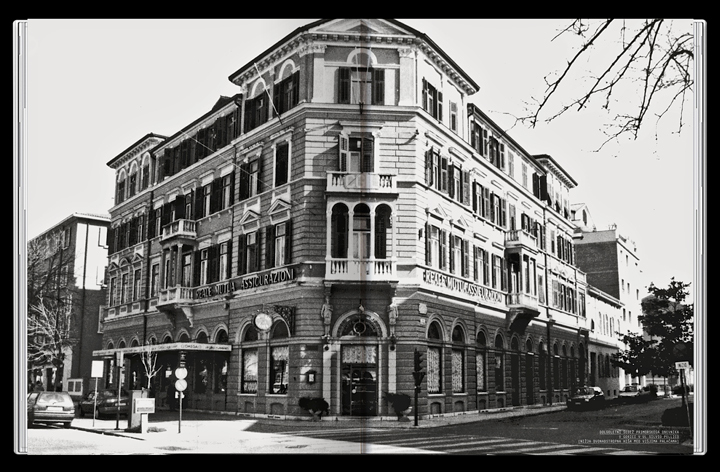 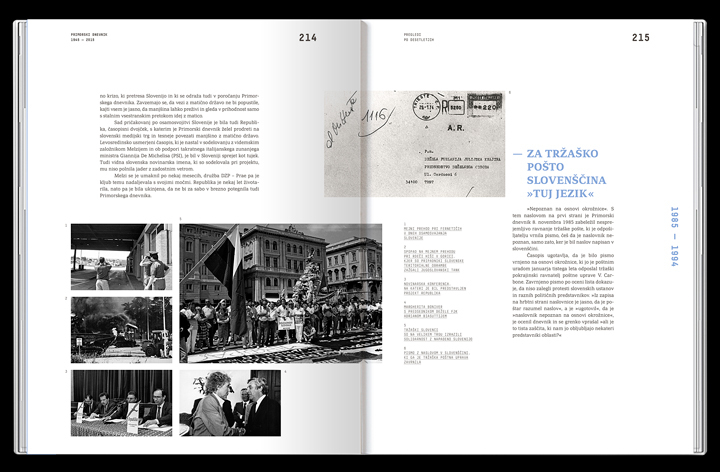 Founded in 1945 by the Yugoslav Partisans that freed the city of Trieste from nazi-fascism, the newspaper became — in the following decades — the herald of the Slovene community in Trieste and in other areas of the Friuli-Venezia Giulia region. 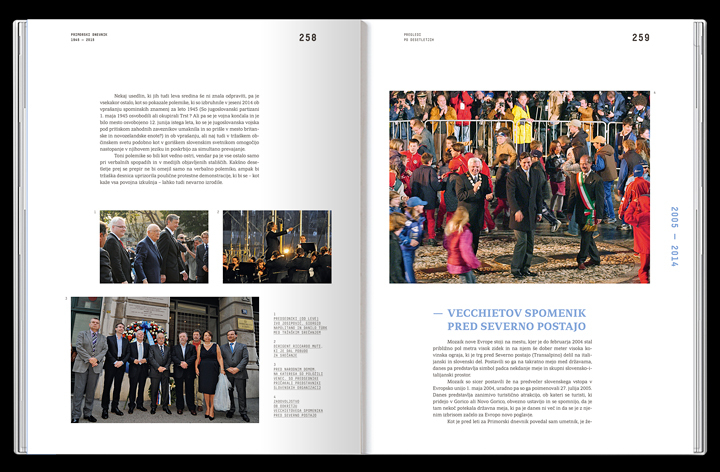 The newspaper centers its reporting on the Slovene community in Italy, but reports extensively also on news from Slovenia and the world. 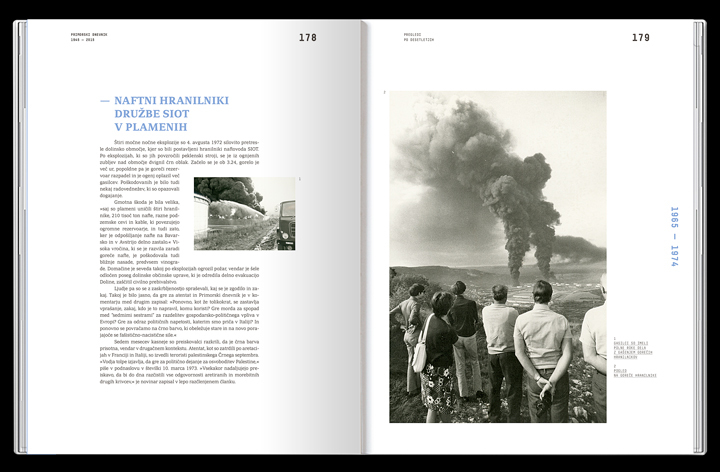 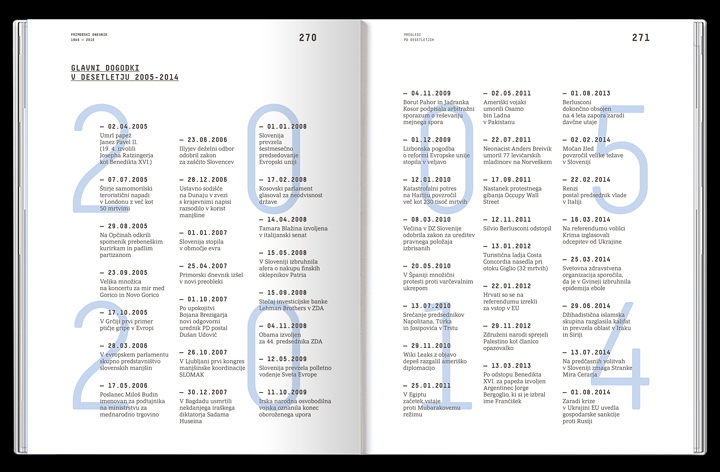 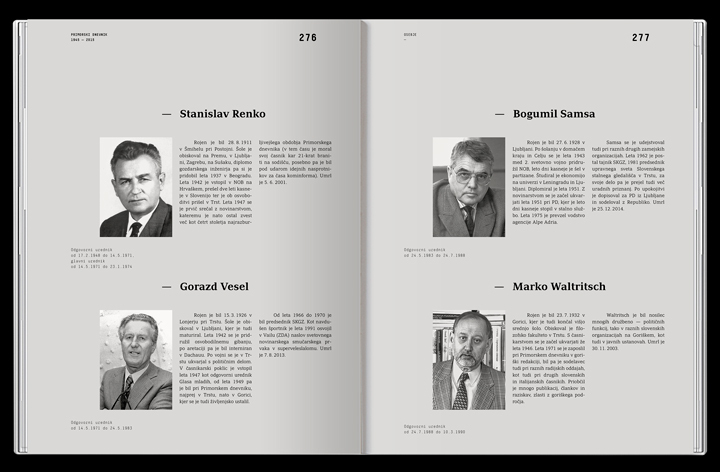 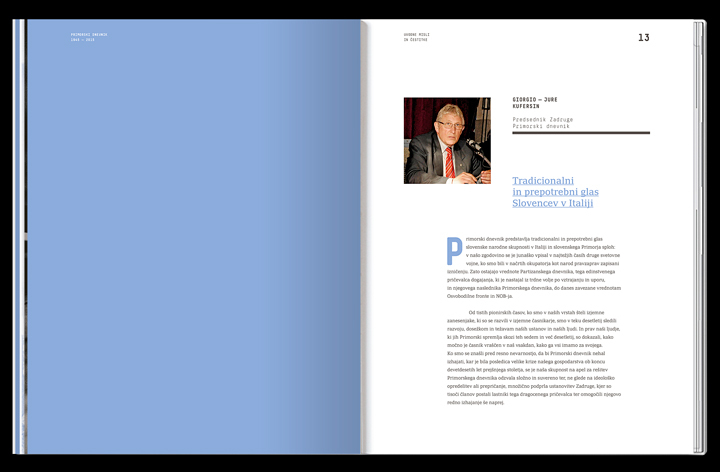 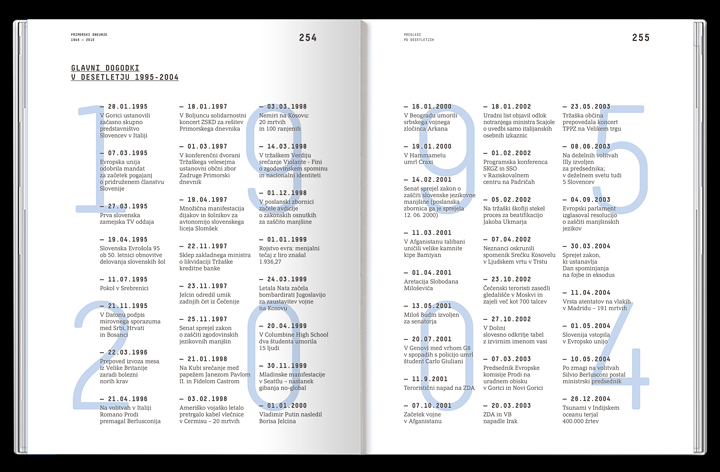 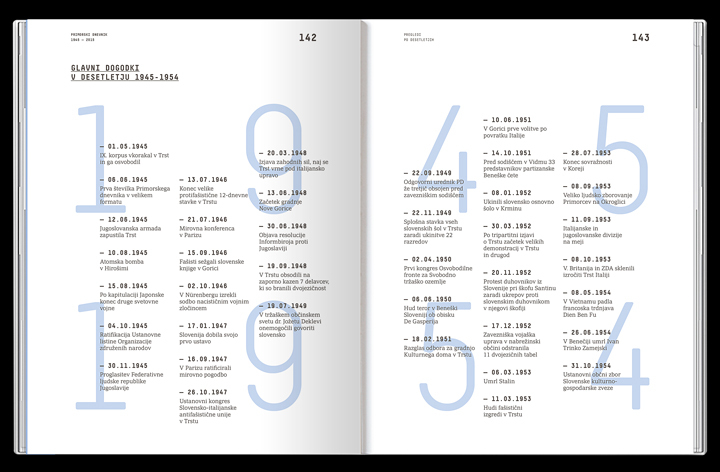 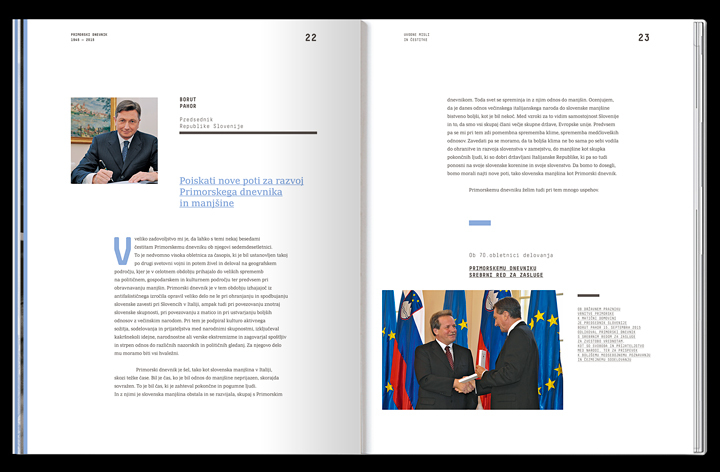 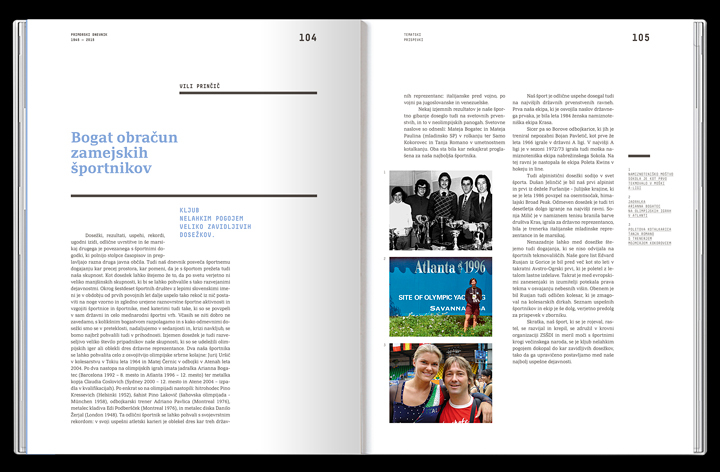 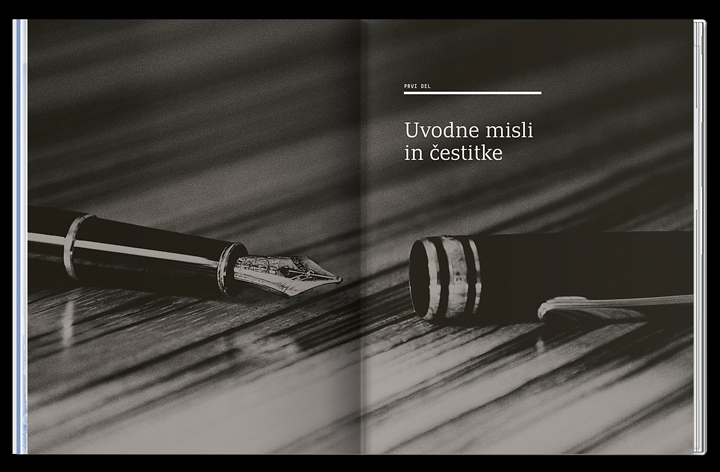 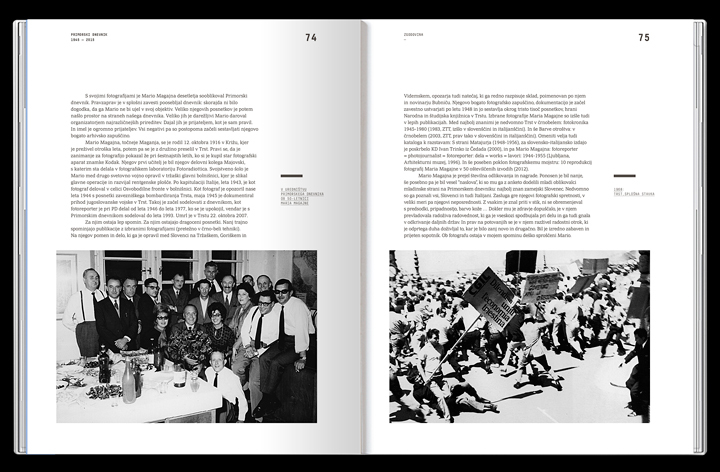 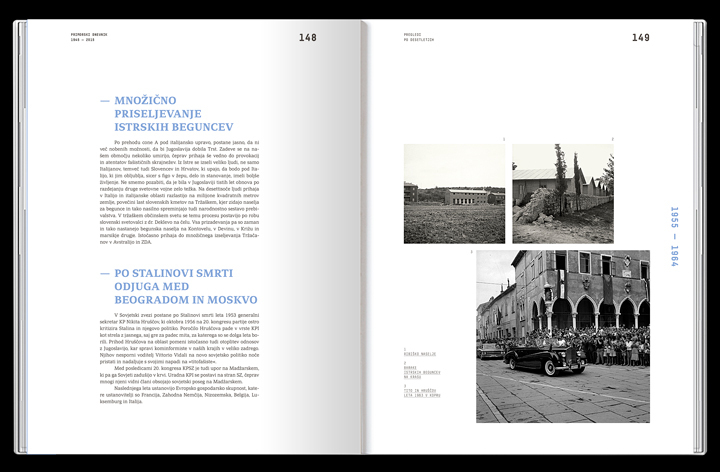 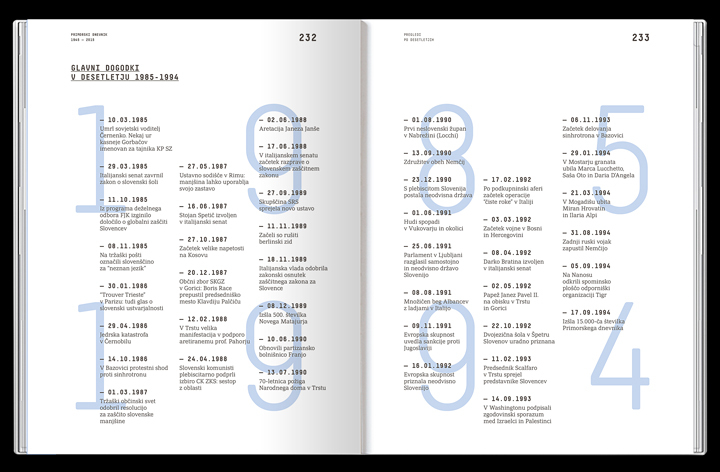 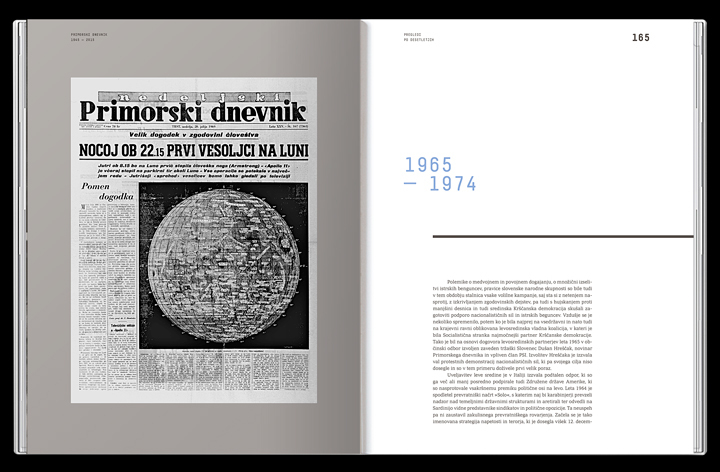 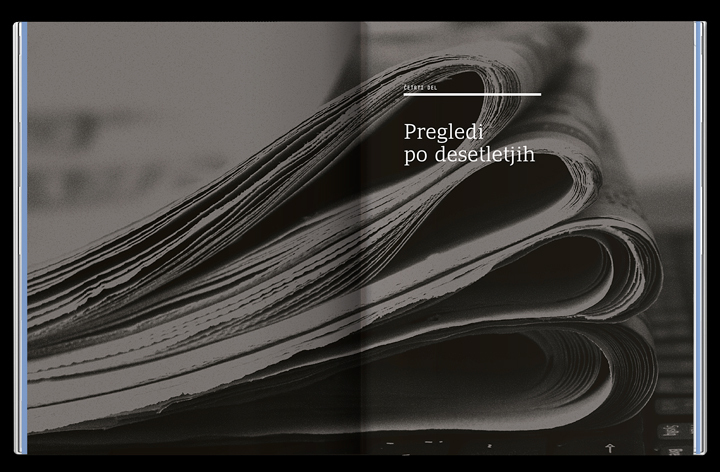 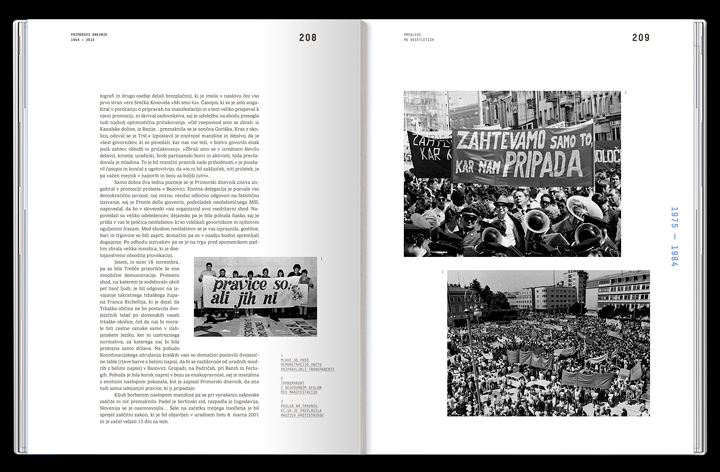 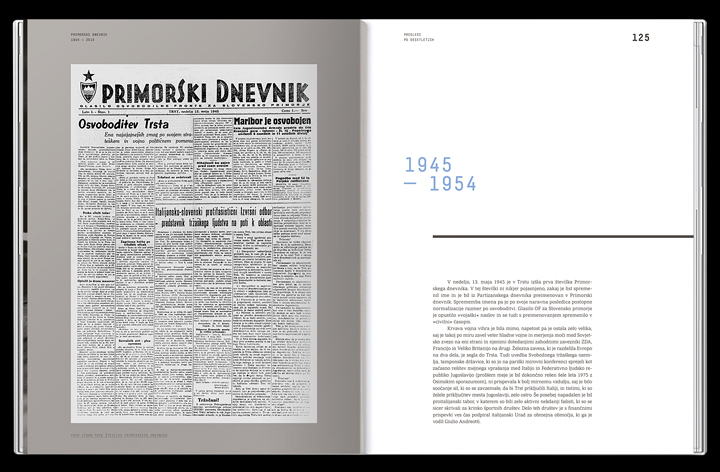 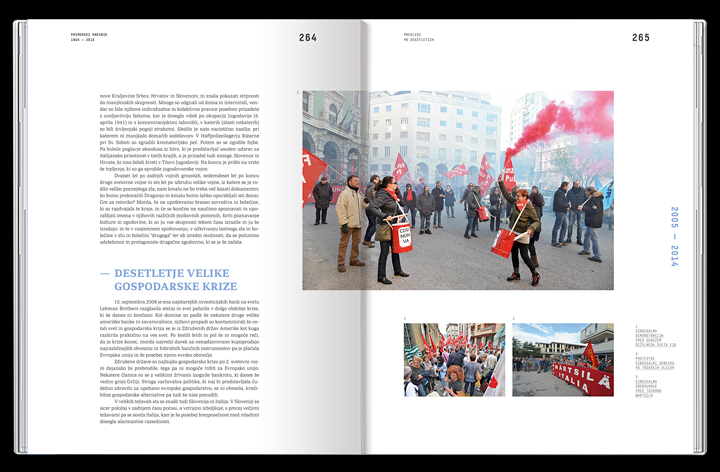 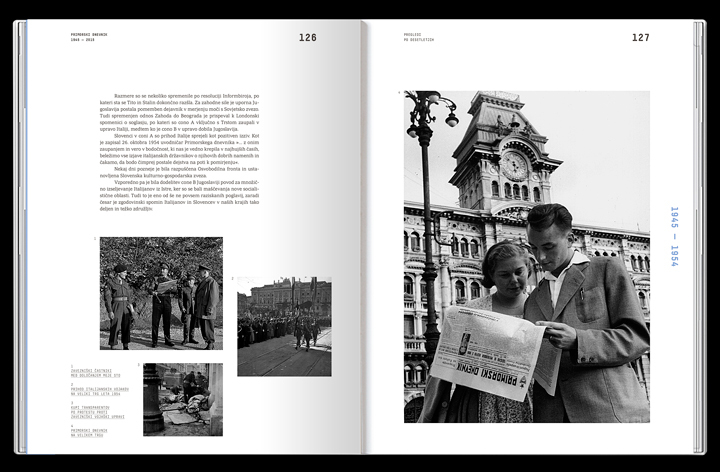 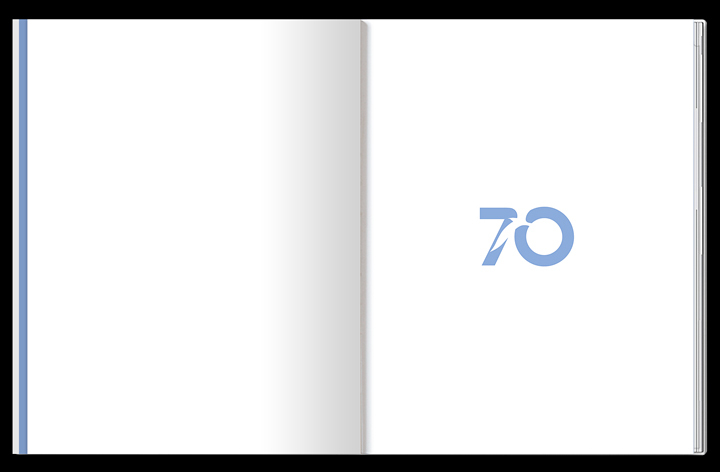 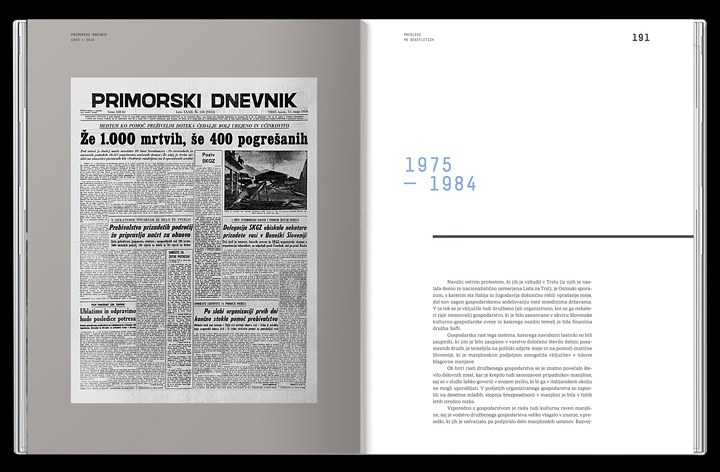 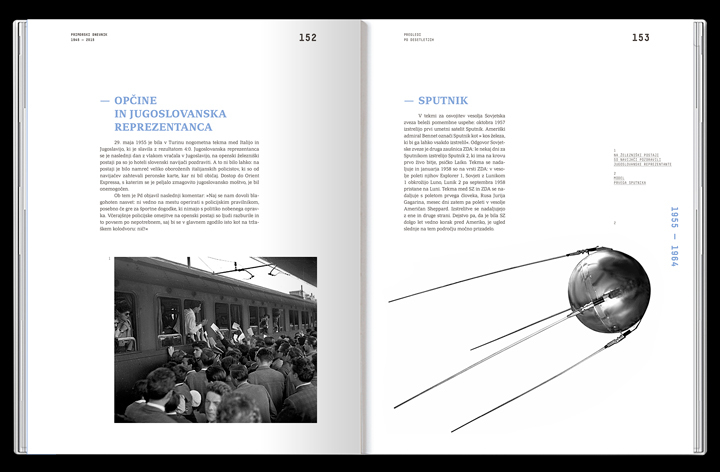 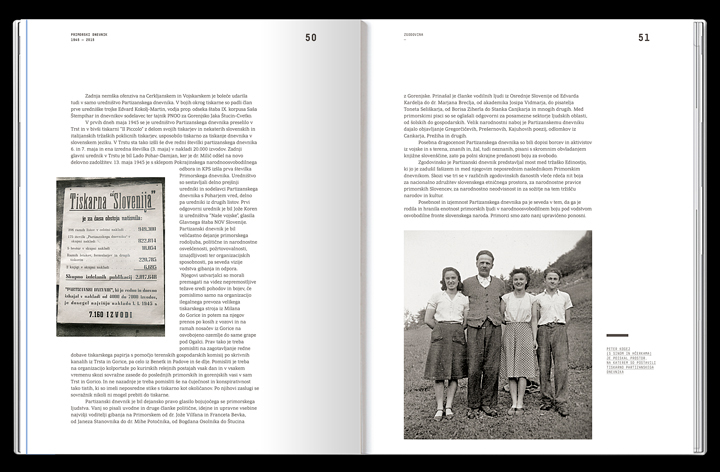 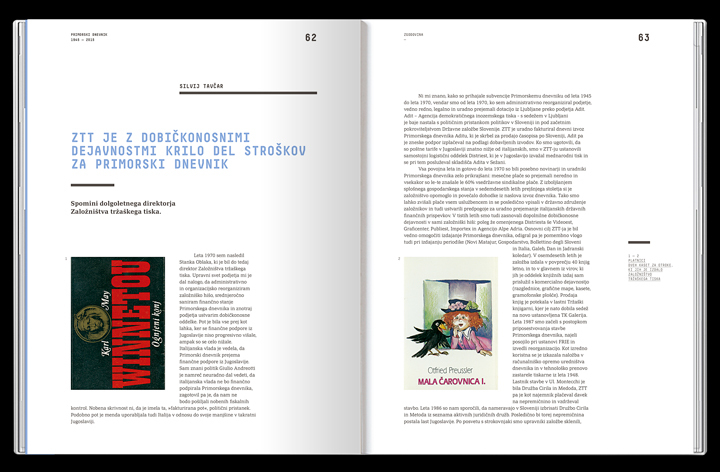 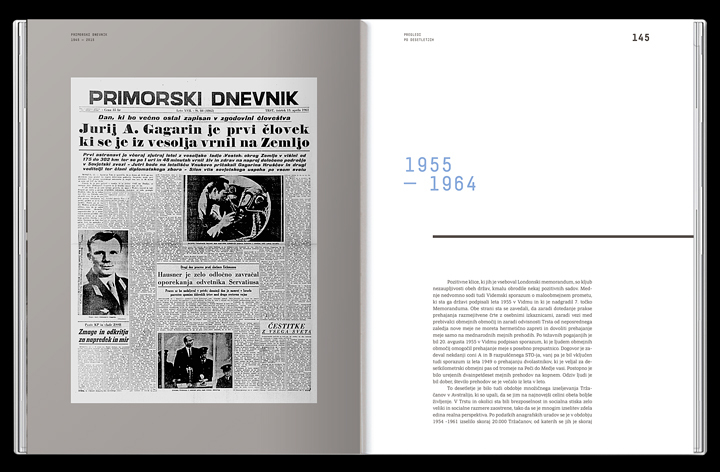 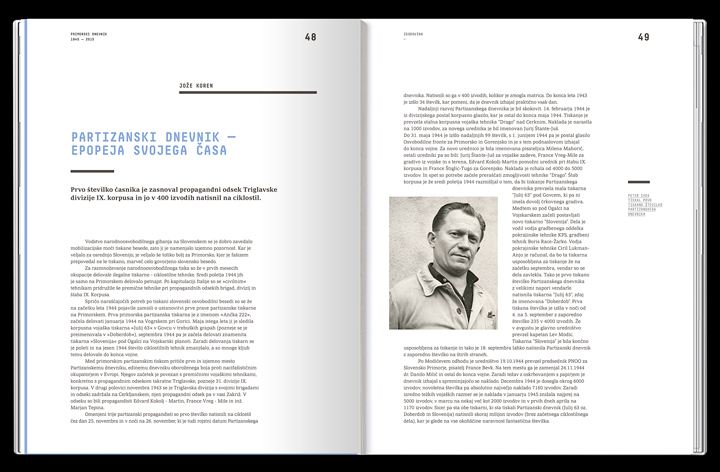 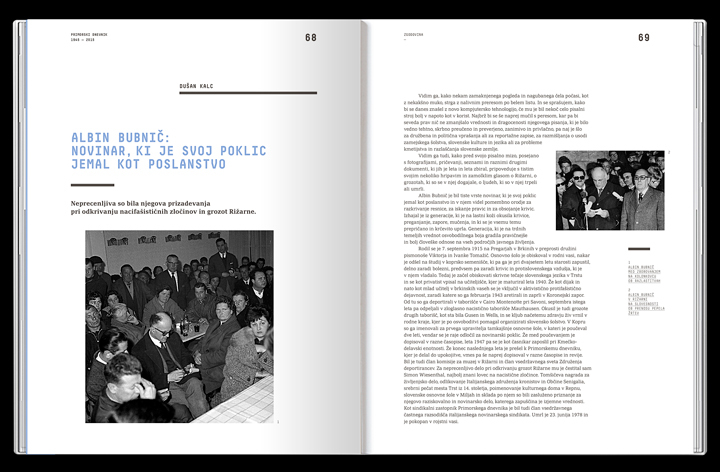 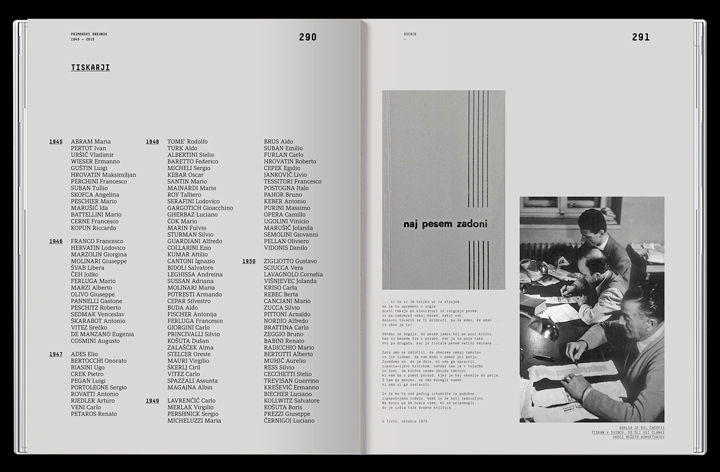 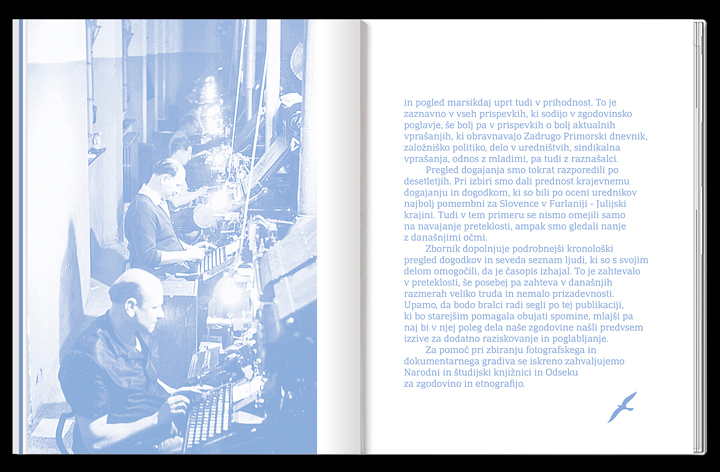 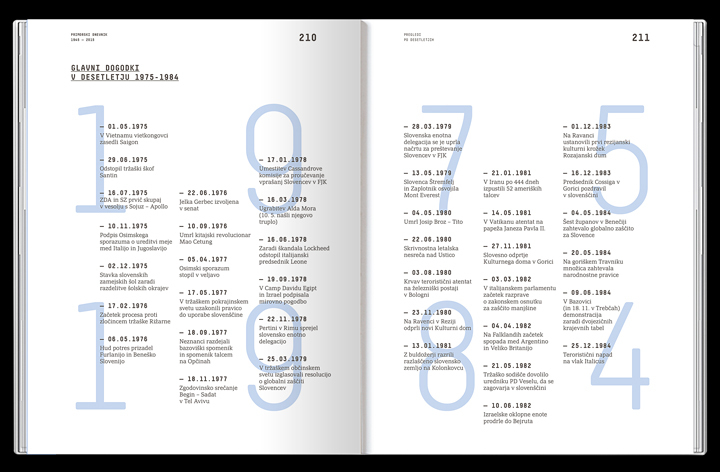 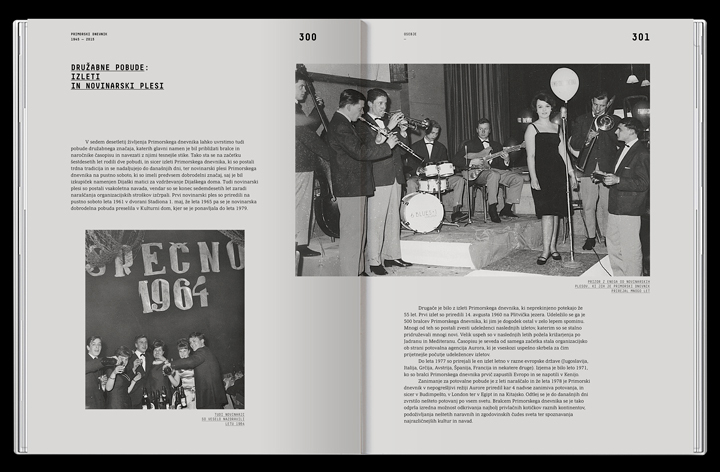 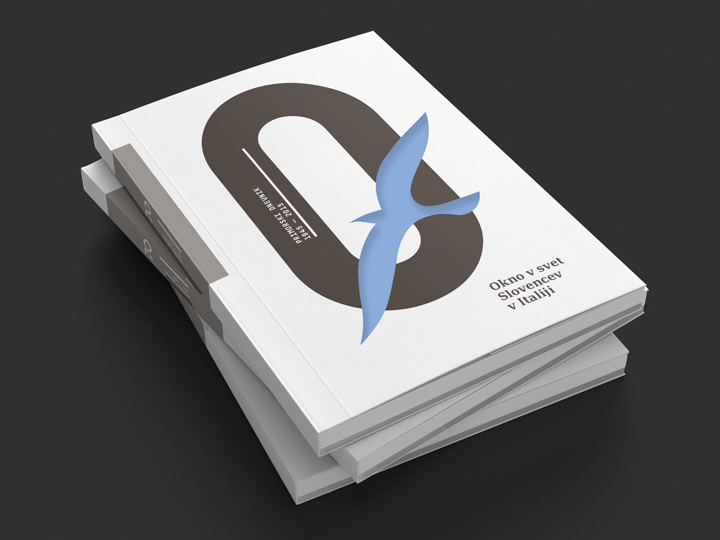 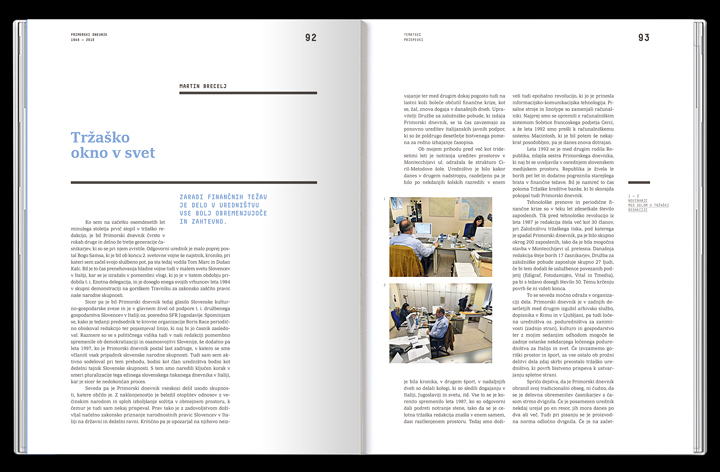 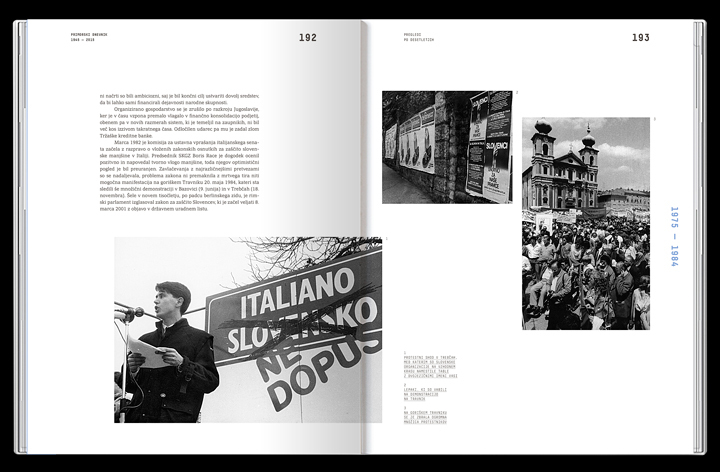 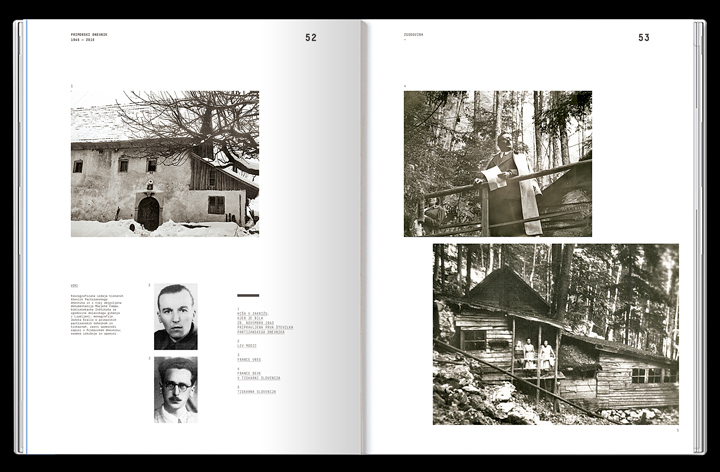 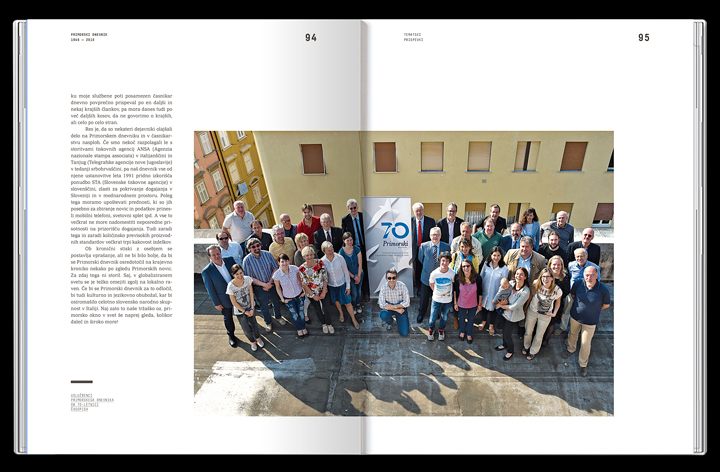 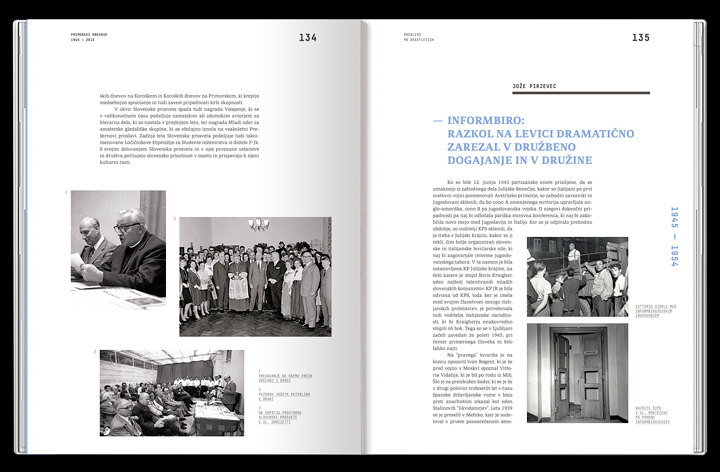 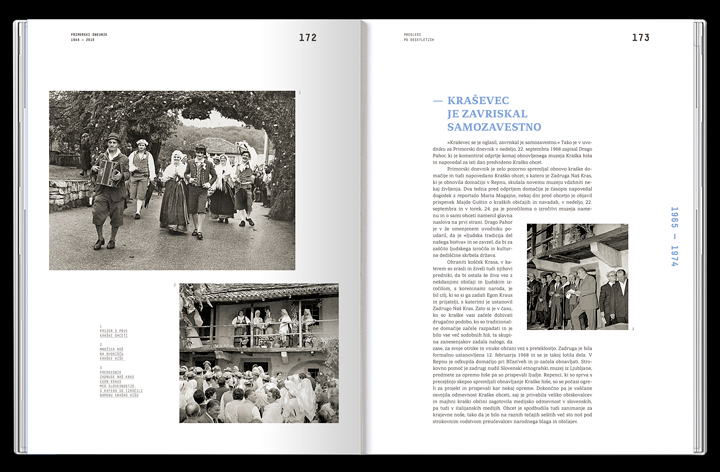 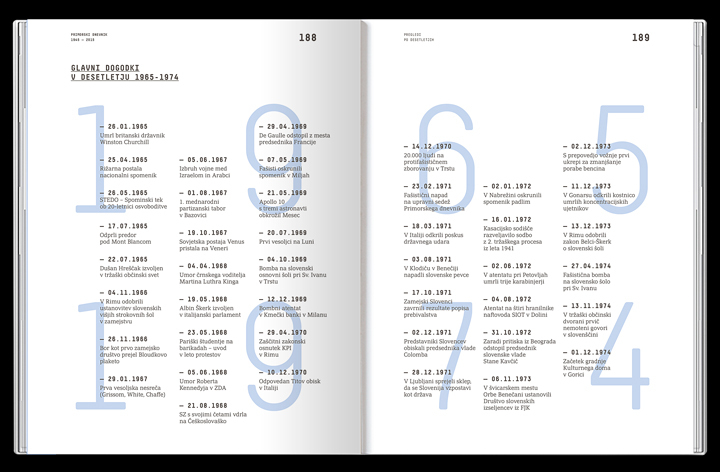 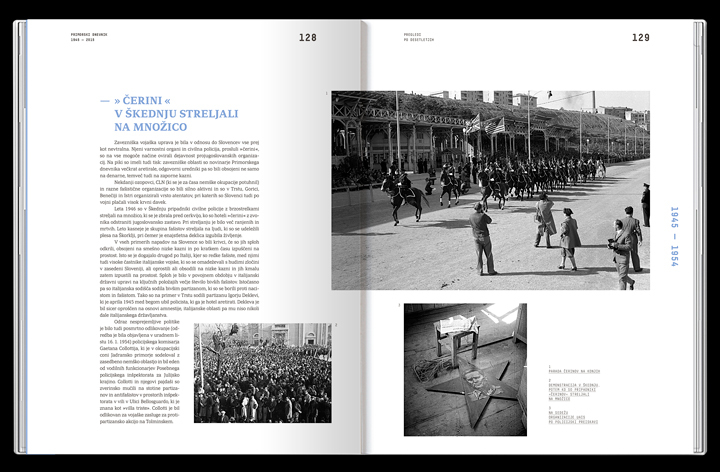 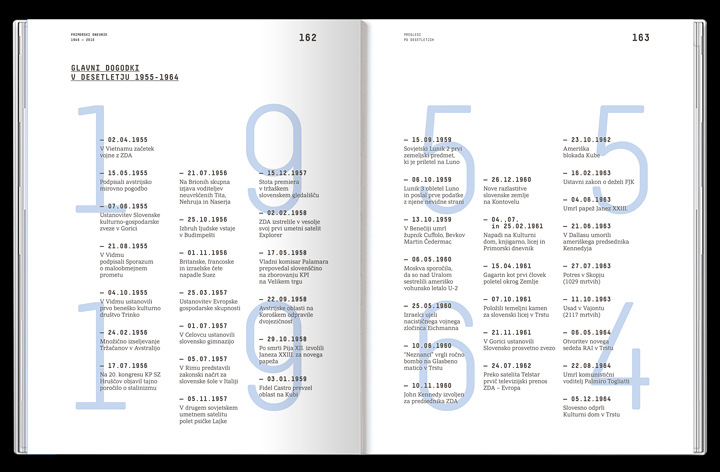 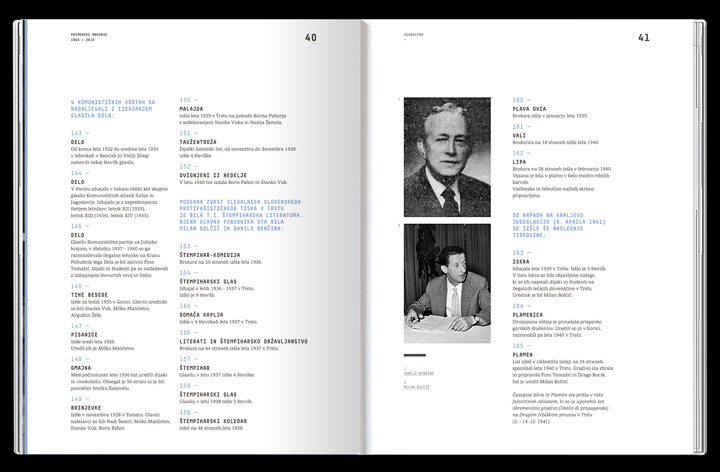 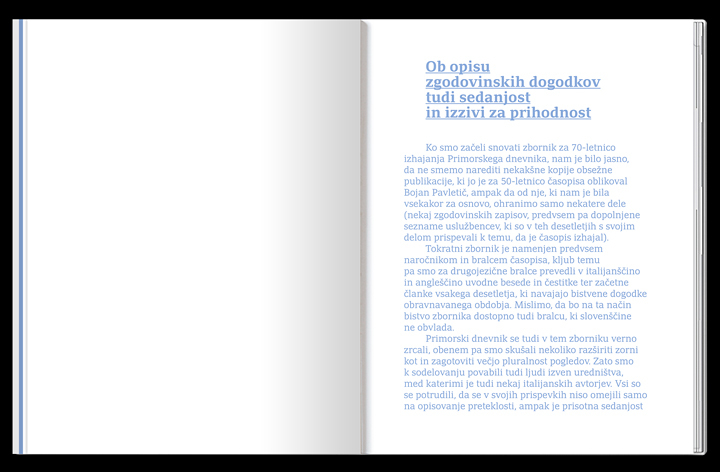 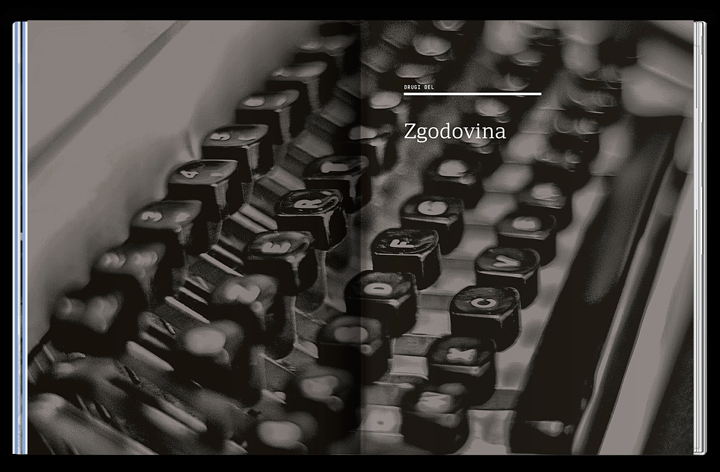 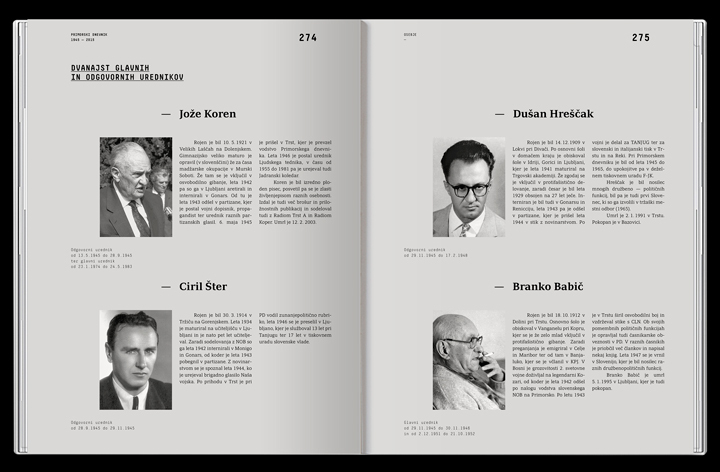 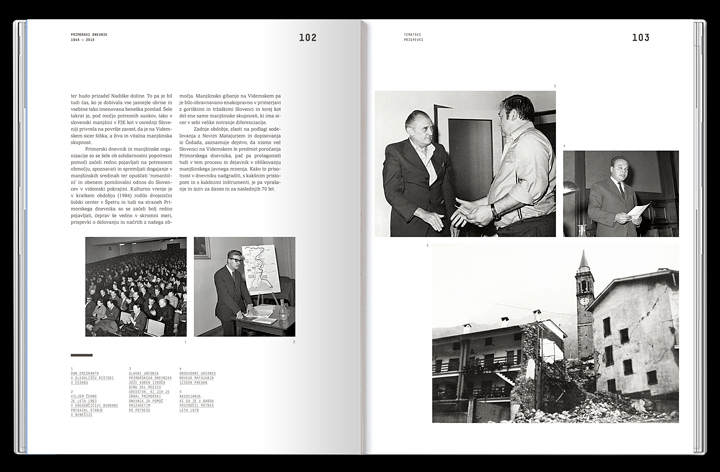 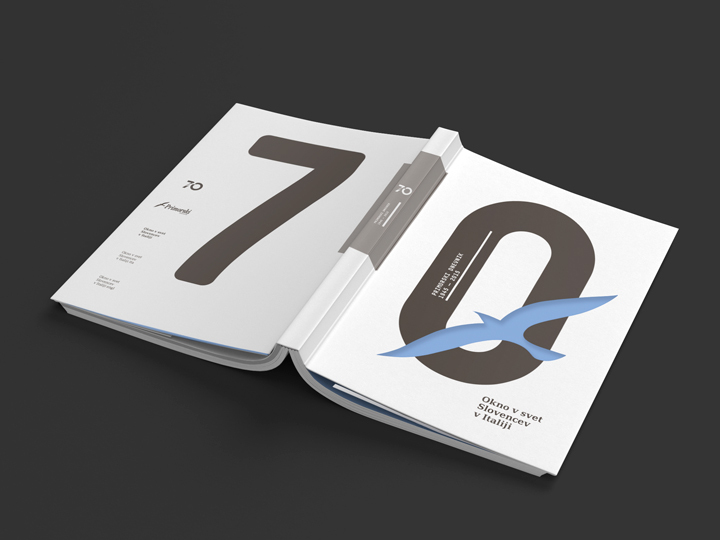 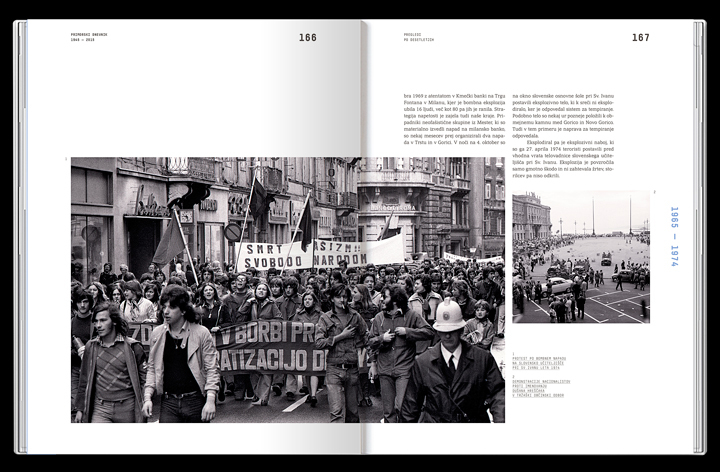 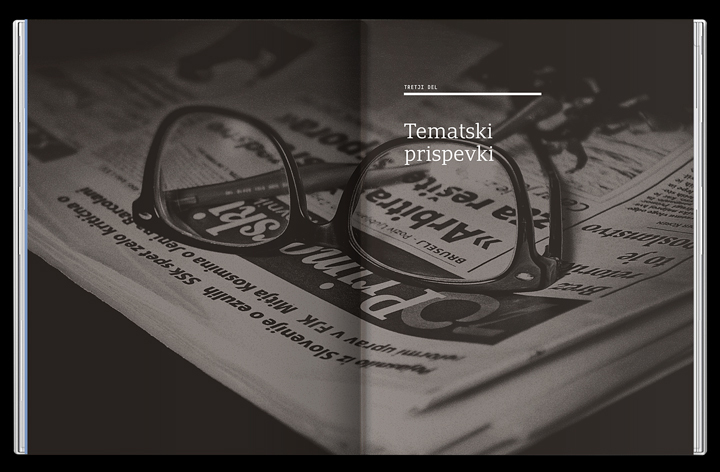 In 2015 Primorski Dnevnik celebrated 70 years of its foundation and, to celebrate the anniversary, in 2016 the editorial staff decided to release a celebrative book, to be given to the newspaper’s subscribers and authorities as a ‘precious summary of the Primorski Dnevnik activity during all these years’. 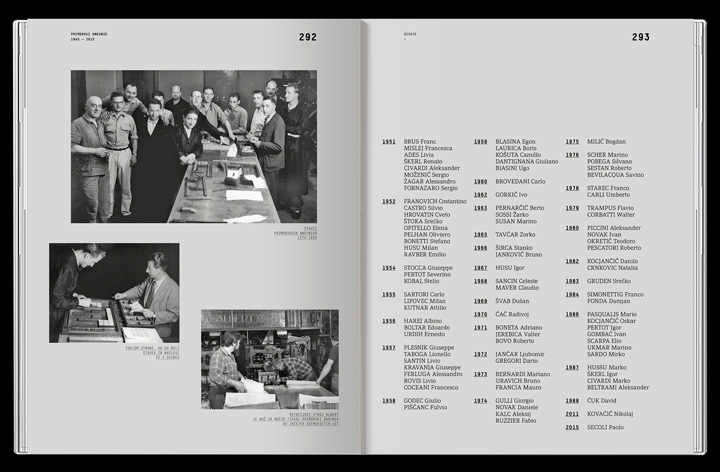 The result is a 336 pages volume which features authority congratulations, intellectuals thoughts, historical facts, archive contents, thematic contributions by various journalists, articles about the most important events (arranged by decades), detailed lists of all personnel working thru the years for the newspaper (directors, printers, editors, commercials) and lots of photographies and ‘historically remarkable first pages’. 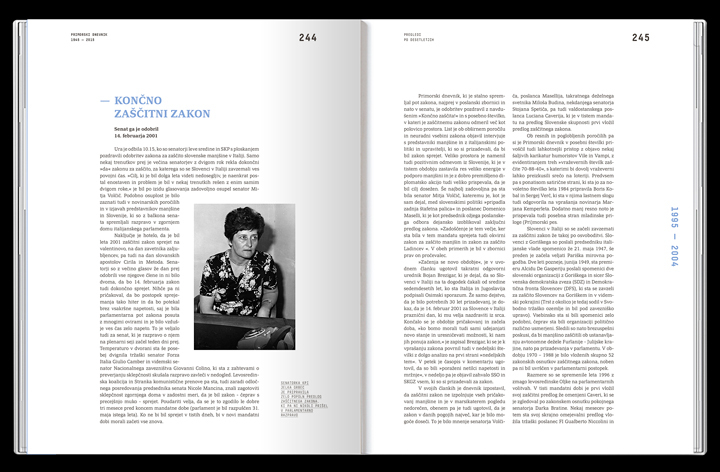 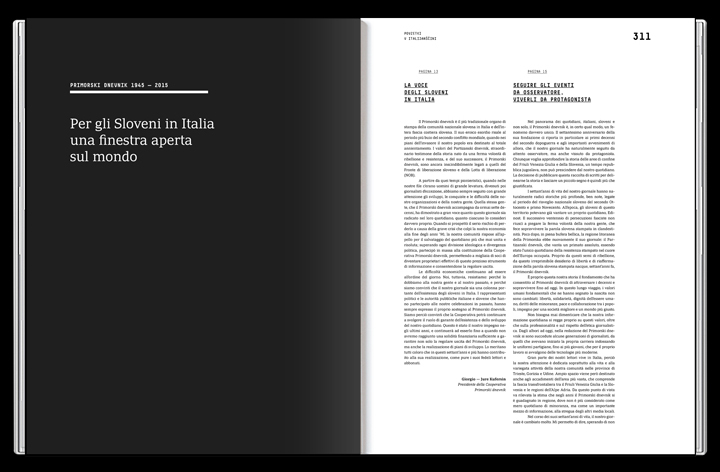 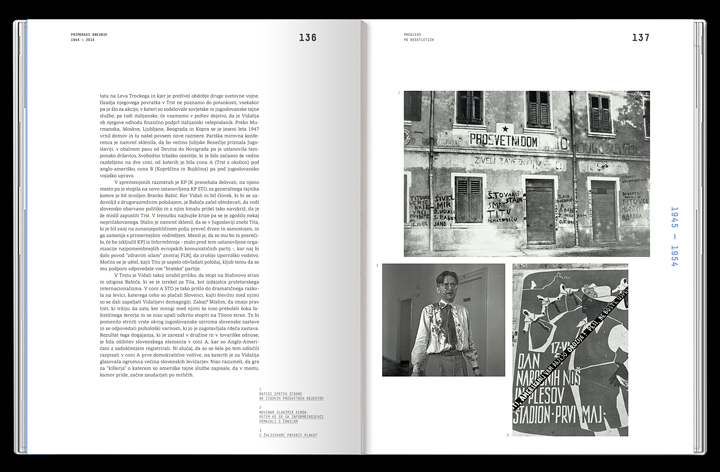 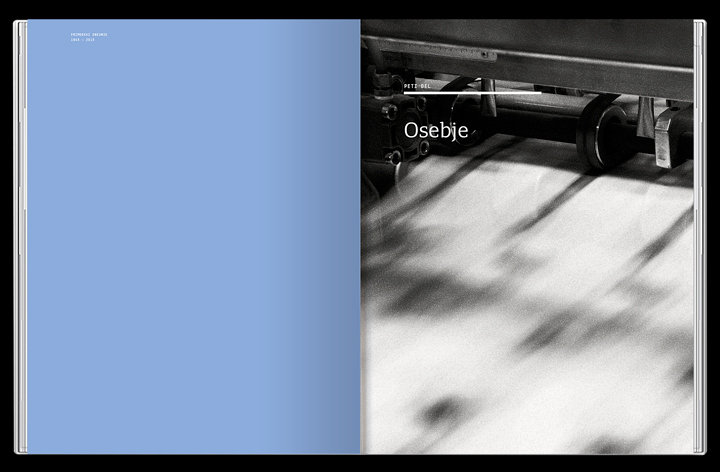 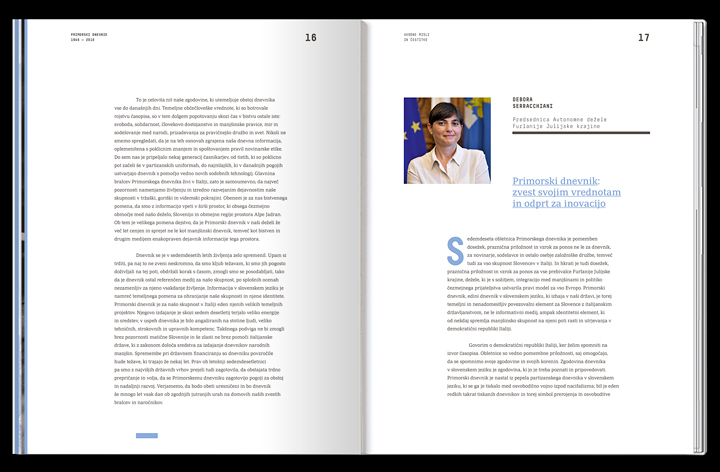 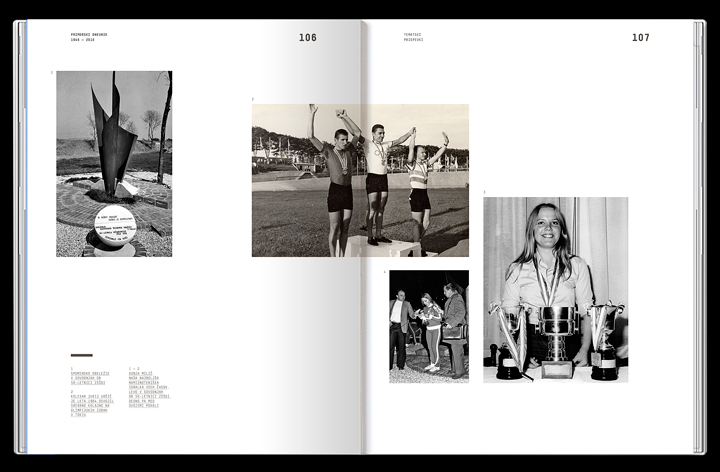 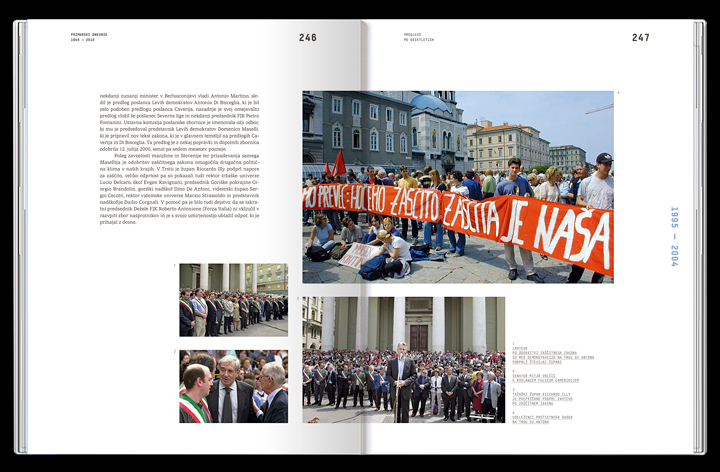 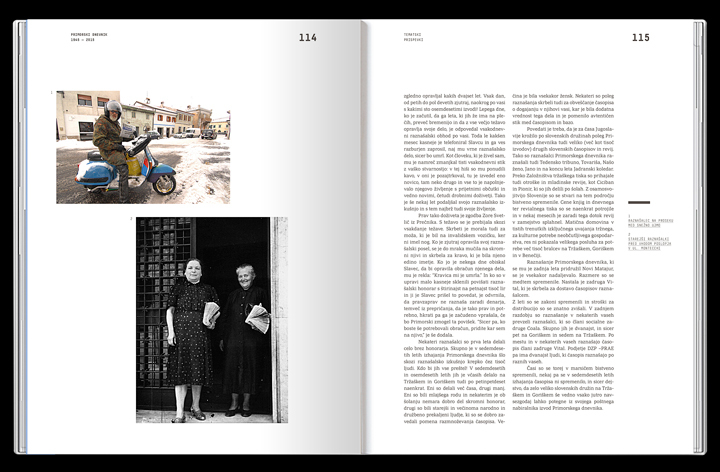 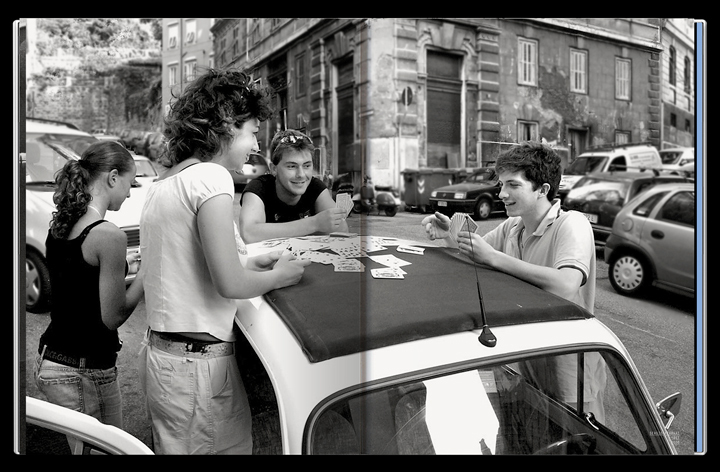 Published in Slovene language, the book features also texts in Italian and English. 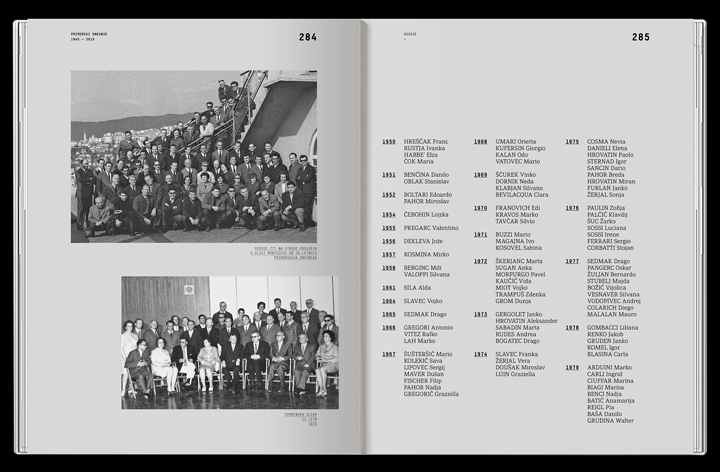 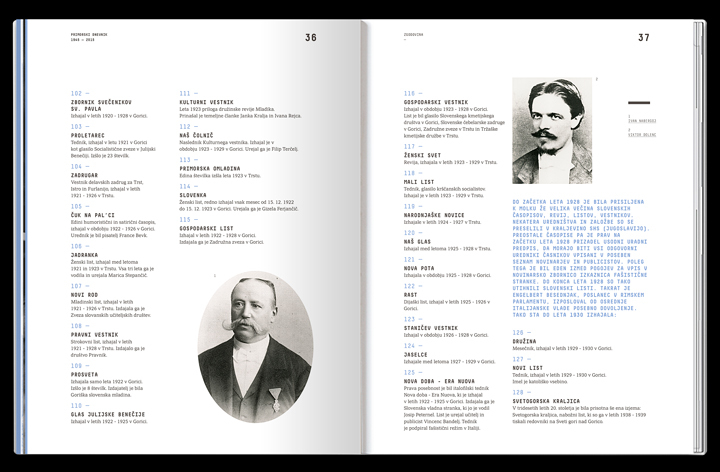 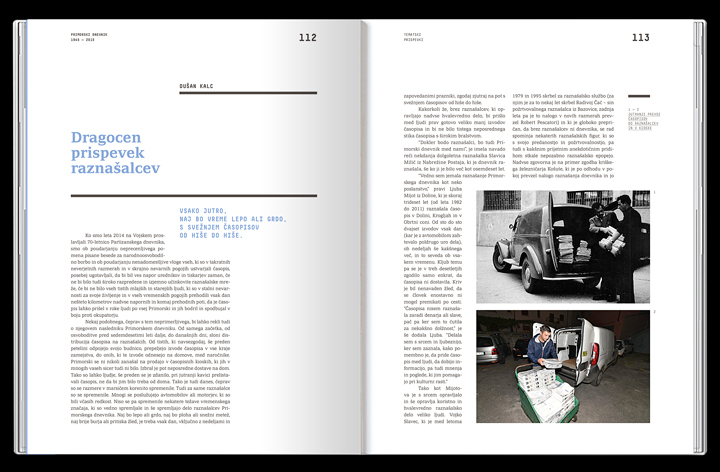 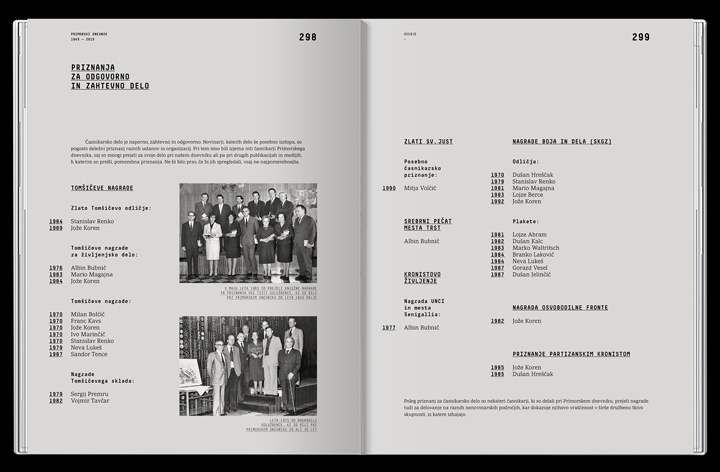 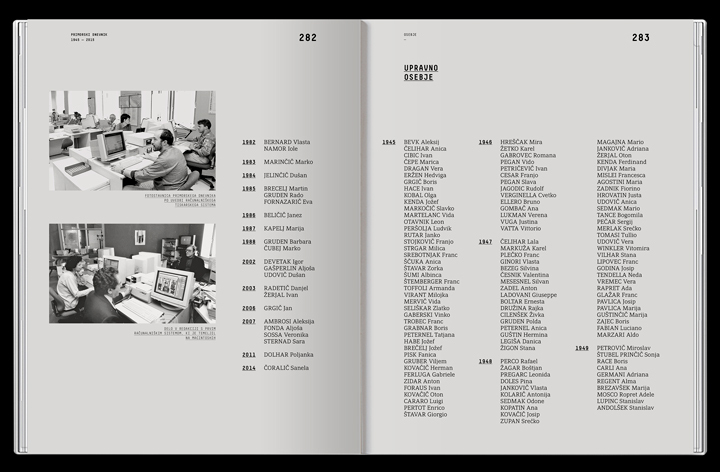 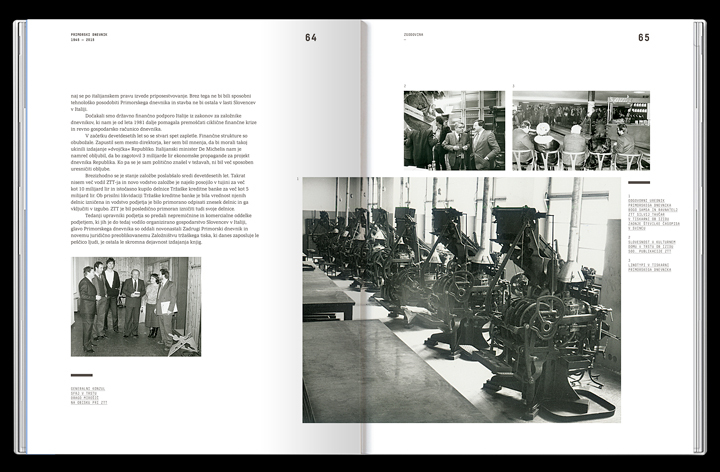 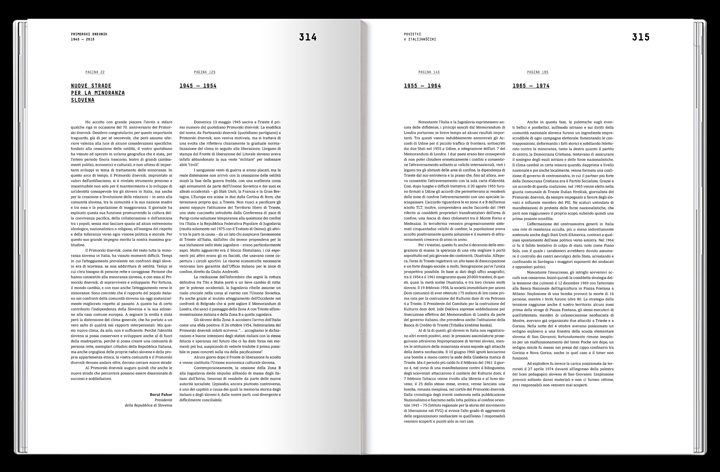 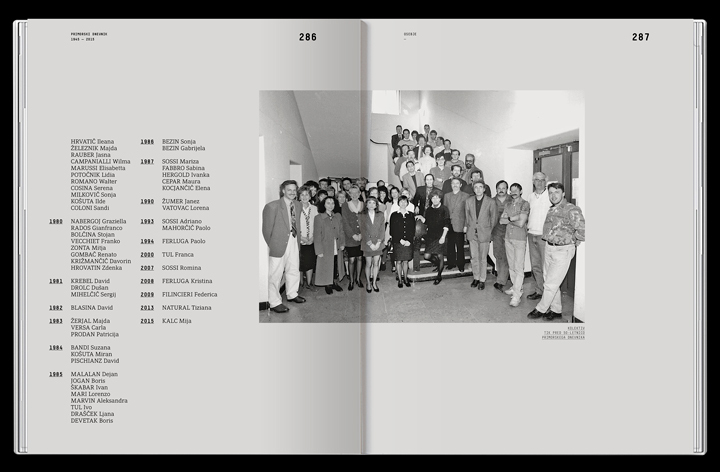 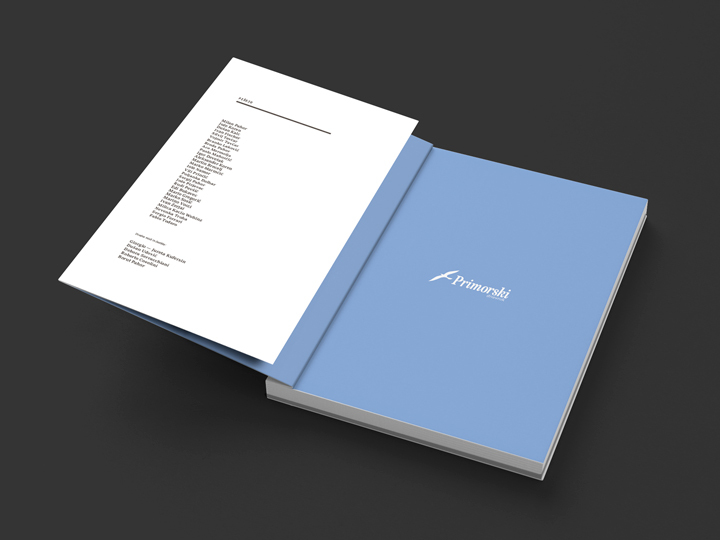 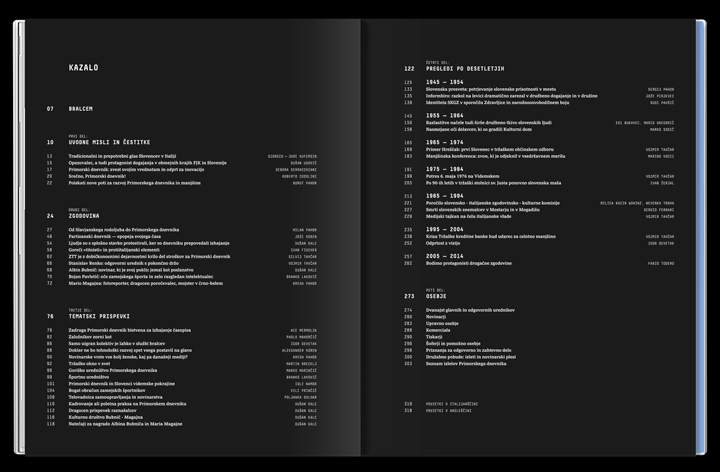 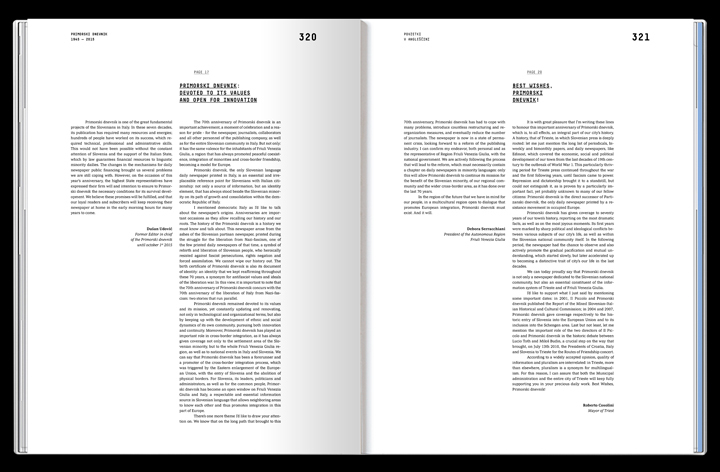 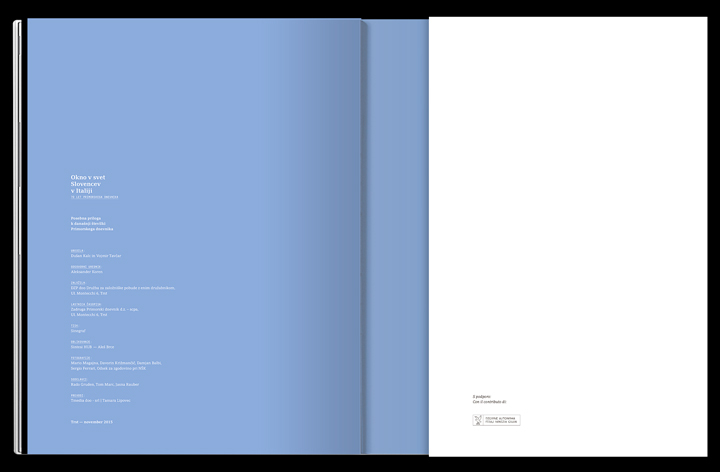 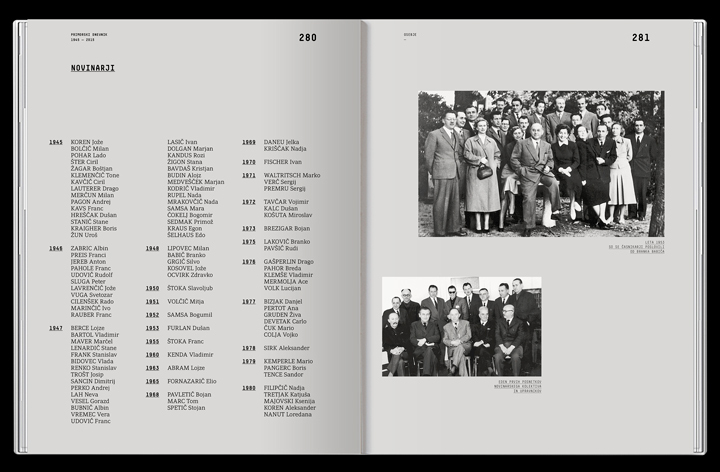 The book was printed on ice-white coated paper (used for the first — articles focused — part of it) and on grey-coloured uncoated matt paper (used for the second — personell lists — slightly shorter part of it). 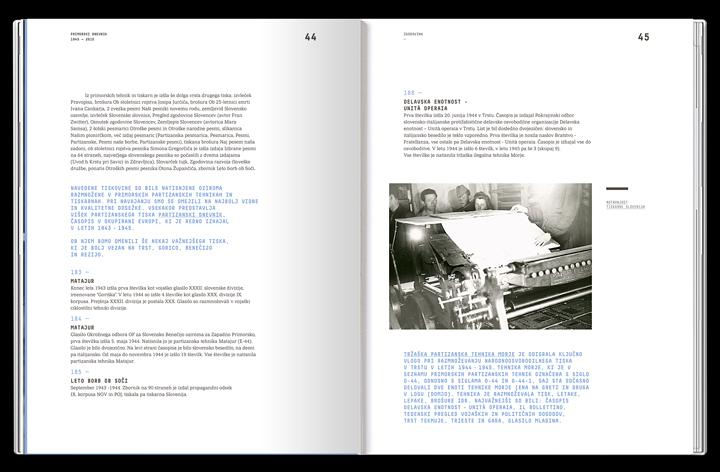 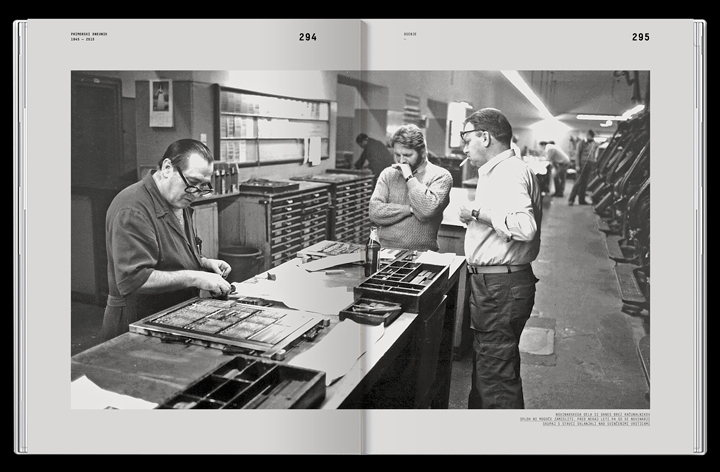 The use of an anthracite look-like metallic Pantone for the graphisms/texts and the use of a pale blue for the titles/openings is a conceptual homage both to the ‘vintage’ printers and typographers of the newspapers (the metallic anthracite connects itself to Linotype machines, movable types, proofreaders) and to the ‘institutional’ blue color of the Primorski Dnevnik (which then connects also with the concept of Littoral, sea, seagull — the newspaper’s current logo). 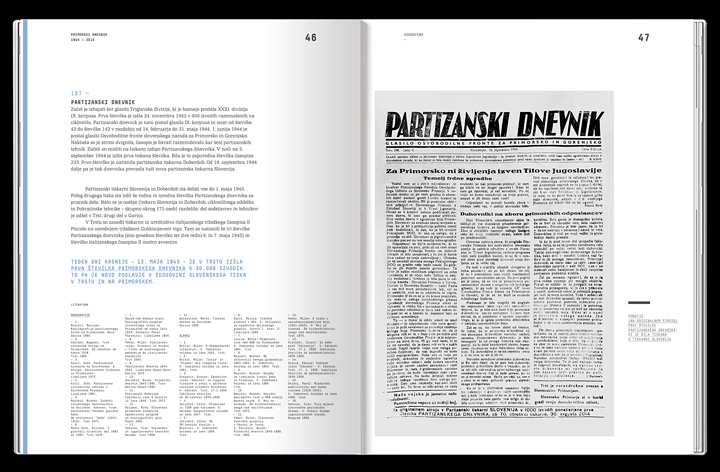 The fonts used are a mono-type and a serif, selected to underline the evolution of editorial trends and technologies from the movable-character-sticks old-newspaper-printing technique to digital, contemporary editorial composition. 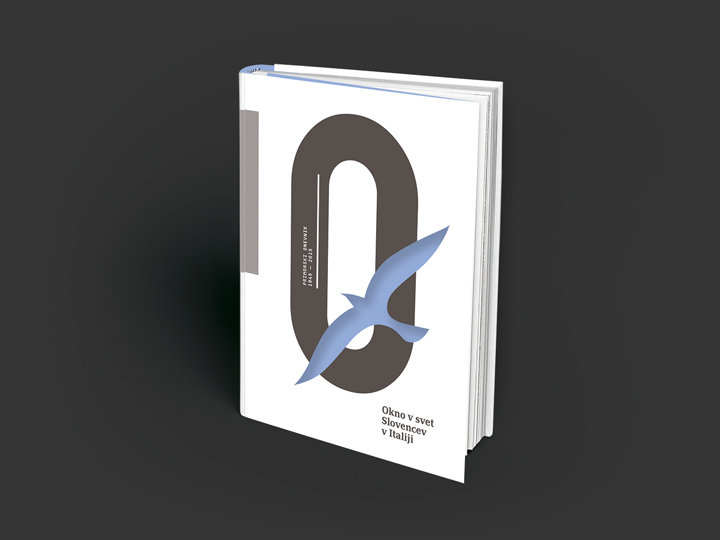 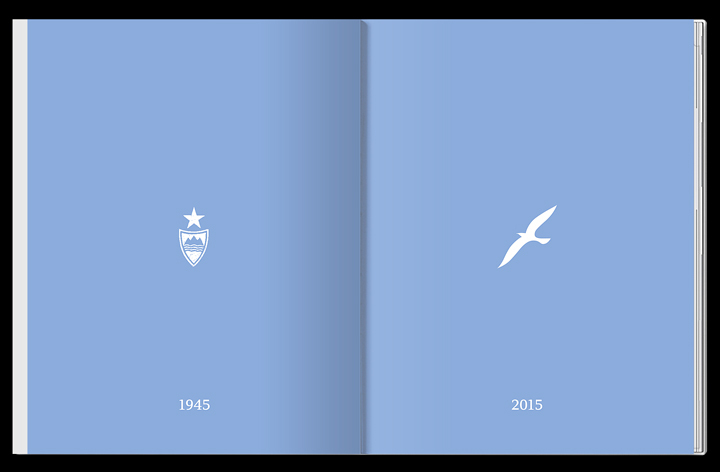 The book cover presented here was afterwards — in the final, printed-cover version — changed with a different one, without the ‘trimmed seagull’ and with a more ‘photographic’ approach.